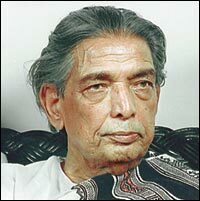 Sayyid Akhtar Hussein Rizvi, known as Kaifi Azmi, was an Indian Urdu poet. He is remembered as the one who brought Urdu literature to Indian motion pictures. Aaj Ki Raat Na Futpaath Pe Neend Aayegi .. ..
Sab Ajanabii Hai.N Yahaa.N Kaun Kis Ko Pahachaane .. ..